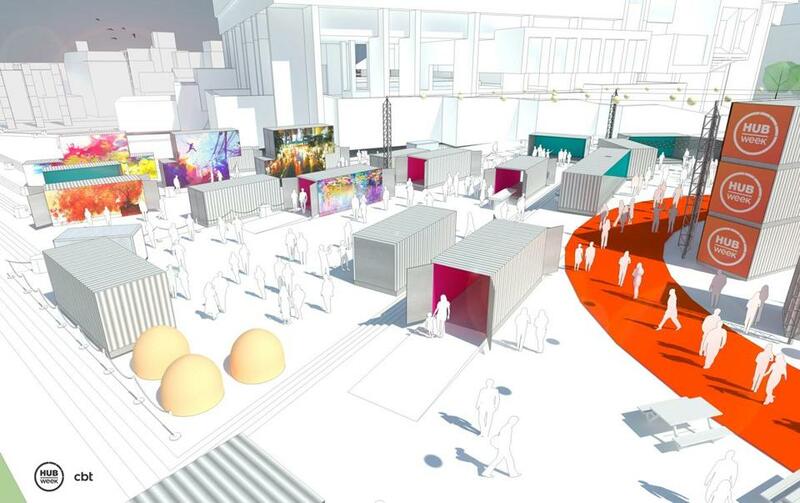 A concept of HUBweek 2017 at City Hall Plaza. They turned Fenway Park’s Green Monster into a giant percussion instrument. What will they do to City Hall? When HUBweek returns to Boston this October, this time spreading out across City Hall Plaza, the festival will include a nighttime arts experience called “Immersion,” incorporating the creativity of more than 100 musicians, performers, and artists Oct. 12-14, three out of HUBweek’s six days. Headlining the show is Masary Studios, a trio made of composer-percussionists Ryan Edwards and Maria Finkelmeier and new-media digital artist Sam Okerstrom-Lang, or “Samo.” Their original composition for HUBweek is called “Brutal Rhythm,” a music, light, dance, and video extravaganza that will envelop the center of the plaza for about 40 minutes each night as musicians and dancers perform in 20-foot-long open-faced shipping containers stacked two tall and three wide, and video is projected onto the facade of City Hall in synch with the rhythms and visuals of the performers. At the inaugural HUBweek in 2015, the trio teamed up to use Fenway Park’s Green Monster as their platform and instrument in the percussion/projection piece “Waking the Monster.” This year, City Hall Plaza’s Brutalist architecture presents them with different creative challenges. “City Hall Plaza is blank,” Finkelmeier said, laughing. The shipping containers will make up for the negative space and give the artists a new edge, and the three will be joined by about eight more musicians and dancers, placed strategically in the containers. But City Hall is still the “main character” of the show, Finkelmeier said. To create the video that will project onto the building, Okerstrom-Lang said he is crafting a 3-D model of it to mimic the dimensions and details. In addition to Masary Studios, dozens of other artistic attractions will be part of “Immersion” in this year’s HUBweek, a festival cofounded by The Boston Globe, Harvard University, Massachusetts General Hospital, and Massachusetts Institute of Technology. The immersive swissnex Dome will feature projections, performances, and more. Other artists will project moving images onto City Hall, including Perry Hall, who will integrate painting and filmmaking using natural dynamic forces like turbulence, magnetism, and gravity. There will be multiple shipping container shows, including “Go to the Light: Neon Dream,” a black-light experience. Participatory projects include “Enchanted Forest,” a “responsive, interactive, multi-sensory ‘forest.’ ” A 49-foot-high geodesic dome will host a live DJ silent disco party, a multidisciplinary jam session, and dance music with Pico Picante. And roving pop-up performances will take place throughout the area. Kaitlyn Locke can be reached at kaitlyn.locke@globe.com. Follow her on Twitter at @ke_locke.